There I was driving home from work, when an ad on the radio catches my attention. It was an ad for a Visa Direct Deposit Prepaid card. Apparently not satisfied with a plethora of prepaid cards that are terrible for users (some are O.K., just not most), Visa would now like you to believe that it’s the next best thing to sliced bread to have your paycheck direct deposited to a prepaid visa card. Yeah, you read that right. The radio ad is the voice of a woman, and she talks about how she has her paycheck direct deposited to a Visa prepaid card. She goes on to talk about how she doesn’t have to drive all the way downtown and stand in a line at her bank to cash the check. Not content to simply portray the card as a time saver, the ad goes on for the woman to say that because she’s not driving all the way downtown and standing in line, she now has so much more time with her daughter. 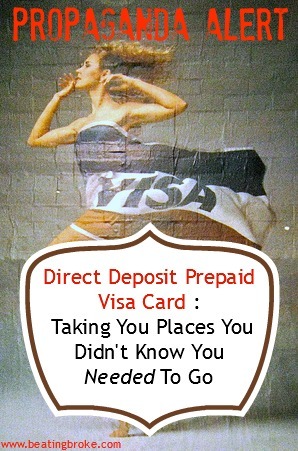 Now, the prepaid direct deposit card is not only a time saver, but a family bringer-togetherer. No, that’s not an actual word/phrase. I don’t care. I have a friend from college that used to make fun of infomercials by saying that all they really did was demonstrate how terribly impossible common everyday tasks can be and then show you a miraculous new gadget to “fix” that impossibility. The problem is that most of those every day tasks aren’t all that impossible. Most able-bodied humans can do them easily without any help from the gadget. It loses a little something without his “demonstration” of the whole situation. Obviously, the tactic works though, or we wouldn’t have those infomercials. Not that we haven’t seen some of this done before. Heck, the level of celebrity endorsements of prepaid cards with outrageous fees is still amazing to me. But, this goes a level further. They aren’t just banking (see what I did there?) on your needing a card with Justin Bieber’s face on it anymore. No, they’re going right for your heartstrings. After all, what parent among us doesn’t desire to spend more time with our children? And this card can deliver it to you! (You should read that last sentence in your best Billy Mays voice. R.I.P. Billy.) In fact, maybe they need the Sham-Wow guy to do the next voice-over for a commercial! Much like those infomercials, the problem that they claim the card fixes just doesn’t exist. Direct deposit isn’t a new service. Most employers offer it. In fact, most actually require it now. It’s just easier for them. No lost checks to try and track down. No delay in mailing a check from a payroll service. And, most of the time, if they direct deposit the check, it gets deposited into a checking account. And, do you know what most of those checking accounts have attached to them as a service? A debit card! It’s exactly like a prepaid visa card, but without most of the fees! Mine has no fees. I’m not sure there are many places that do have fees, in fact. Maybe I’m wrong. Maybe there’s a whole population of the country who’ve been waiting patiently for someone to come along and solve this very problem. Maybe they still bank at an institution that keeps their account records on old green ledger books. If that’s so, I’d like to introduce them to the amazing egg shell separator that I’ve created. Yes, it looks exactly like the lip of a mixing bowl. But, it doesn’t have the added bulk of the bowl! It’s just a convenient shard sized device that helps you separate your egg shells without having to have the whole mixing bowl there! Yes, I came up with the idea when the bowl I was cracking eggs into suddenly grew heavy in my arm and fell to the ground, breaking into lots of small pieces. And one of those pieces was the prototype for the amazing egg shell separator! What do you think? Am I wrong? Was there a need for a product like this? Or is Visa just pulling on emotional strings to get more cards in peoples’ wallets? This is just how marketing works. They make it easy for you to think that they are solving a problem, but they are just creating it in order to solve it. Classic marketing. They see the power of prepaid cards, so they are going for it. You are not wrong! A very nice analysis. That products like prepaid cards have become a hugely profitable business speaks volumes about the pathetic level of personal finance education Americans get. I wonder if this will become a case study in business school one day. Heh, companies these days will do anything to make a quick buck. I think it’s all about the spin. Classic. I get equally frustrated by all these “checks” that keep coming in the mail from my credit card company. I throw them away, but how many unsuspecting/needy Americans are pulled into this scheme and pay thousands in needless cash-advance interest. Great job calling this. The finance industry is constantly pushing out lousy products and I’m glad that someone is taking the time to call them on it.